Brick streets, mature old oaks, and a sense of history imbue Winter Park, Florida with a sense of place that is the envy of many small cities and towns. The tony Park Avenue brings shoppers and visitors, who soak up its ambience and enjoy the street life of this quaint southern town. On the east side, bounded by blue lakes, lie gentrified historical mansions, while the west side is a neighborhood of smaller, affordable homes with multigenerational Winter Parkers. This community of little single-family homes is now endangered by developers that are gobbling up parcels two and three at a time, increasing the density threefold, and squeezing out residents in a new, “zoning for dollars” economic climate. Affluence and affordability have always maintained an uneasy truce, and the balance between them has historically been protected by cities through planning policies and an understanding that the mission of a city is to be workable for all of its residents, not just the wealthiest. Unfortunately, this balance tilts when the density imperative drives land values up, and tips the scales in favor of half-million dollar townhomes. High density has become fashionable in Winter Park these days, as it has in many cities, and there are some benefits to this new style. The costs? Well, those will be counted later. Density’s benefits look great on paper: a higher tax base, expensive new housing, walkable urbanity. When implemented well, these can make for positive changes. Advocates preach careful, sensitive ways to develop: don’t smash large and small buildings together; don’t mix uses on a street, and ramp up from low to high density across a gradient of a block or two. Advocates also preach a consensus-building process to avoid neighborhood clashes over growth issues. In places where this has happened, like Coral Gables in Miami, the story has mostly been a good one. The west side of Winter Park, with its cottages and modest residences for families, dates back to the 1920s. Within the neighborhood are many small churches to which residents walk on Sundays. Playgrounds, parks, and a community center characterize the West Side’s tree-shaded streets, and its proximity to the downtown area means jobs for many of its residents. For the last ninety years, the city has evolved around this neighborhood, and many families go back several generations. Its diversity includes many African American families, mixing with whites. It carved out a niche in the city. Today, the West Side is an older and less affluent neighborhood that happens to be close to a desirable address. The West Siders have already chosen their preferred building pattern and rhythm, infilling their blocks with new homes of similar size and scale, enlarging the tax base. They already live a walkable urban lifestyle, use mass transit, and evolve with slow and organic growth. In short, every urbanist’s dream. Like many cities that have a working class enclave that butts up against a newly trendy one, Winter Park has encouraged dense, mixed-use development, while nominally protecting its existing neighborhoods. And this is where the density equation seems to fall apart. The residents who leave the area will no longer participate in the economy of Winter Park. The new residents of half-million-dollar townhomes probably won’t ride the bus, walk to the churches, or otherwise activate the local streets. So a natural piece of the city is lost forever. Urbanism, for all that has been written in favor of this ideology, is diminished for the sake of density. West Siders protested in City Hall, asking the city not to upzone their neighborhood. While City Hall nodded to its citizens, it had already quietly allowed upzoning to take place, taking advantage of tired homeowners who decided to cash in. Half-million-dollar townhomes, which could be built in other areas, are instead being built here, to take advantage of low land values. Parking garages and midrise apartments now cast shadows on the adjacent small houses. Land values may rise on those parcels with new townhomes and midrise apartments, but immediately next door, the remaining adjacent little one-story cottages become particularly undesirable; the value of those homes becomes depressed. The owners' only hope is to sell off to a high-density developer. Step by step, high density becomes more and more inevitable as the only solution left. The market forces at work in Winter Park have played out elsewhere across the country, with old neighborhoods eroding. This time around, with density all but institutionalized as the only acceptable way to grow, the deck seems to be stacked against entrenched locals. Cities are re-writing their development codes in favor of shiny new mid-rises and high-rises, ignoring existing residents who won’t be missed till they are gone. When the market, an amoral institution without sentiment, threatens neighborhoods, it is the job of City Hall to provide a hedge that ensures balance and fair play. But citizens have to shout over the money in order to be heard, so local groups like the Friends of Casa Feliz have stepped in on their side. If “zoning for dollars” can work against this section of the city, groups fear, then no one is safe, and people are reminding City Hall of its duty as a guardian of its residents. Density, on its own, is neither a good nor a bad thing. It can make a city more efficient and connected, and proponents tout its reputed health benefits and contribution to a thriving social life. When, in the process of allowing density, a city destroys the very values that it is supposed to promote, then the city ends up cannibalizing its neighborhoods for little benefit other than the one-time gain that the developers will realize from the sale of these newly built products. Income streams are put into mortgage-holders’ pockets, and, bit by bit, one more highly localized economy disintegrates. City halls, so obsessed with petty regulations, would do well to recall their basic functions as protectors of their residents. If there were a “back to basics” movement for government, many ordinances written to benefit the few would be shed, and there would be a refocus of attention back to the public good. The current infatuation with density, like many fashionable ideas, may come and go, but if a multigenerational neighborhood goes, it won’t be replaced in our lifetime. 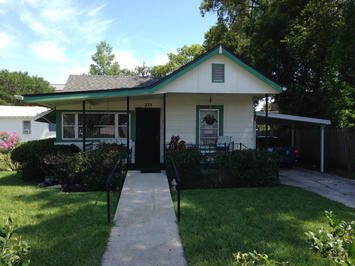 Photo by Betsy Owens of the Friends of Casa Feliz: "Preserved 1920s Cottage on Lyman Street", Winter Park, Florida.